A recreational vehicle (RV) is more than just another vehicle. It’s a beautiful combination of house and automobile that lets you travel in comfort anywhere the road will take you. And although many RVers would love to answer the call of the open road all year long, most of us have other obligations. The reality for most people is that their RVs sit parked for most of the year. During this off-season, it’s very important that you properly protect your RV so that it will be ready to go again whenever you are. 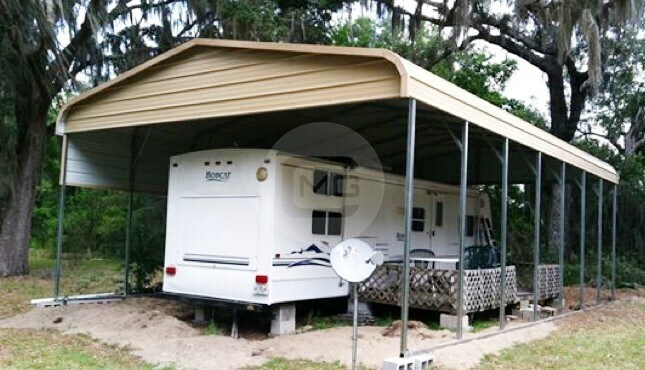 Some owners choose to place a tarp or fabric cover over their RV. A tarp or cover is better than nothing … but not by much. It still leaves your RV exposed to weather extremes, and provides very little in the way of security. A metal RV garage is a much more effective and secure way to protect your RV or pull-behind camper. Metal Garage Central has an excellent selection of RV garage options. 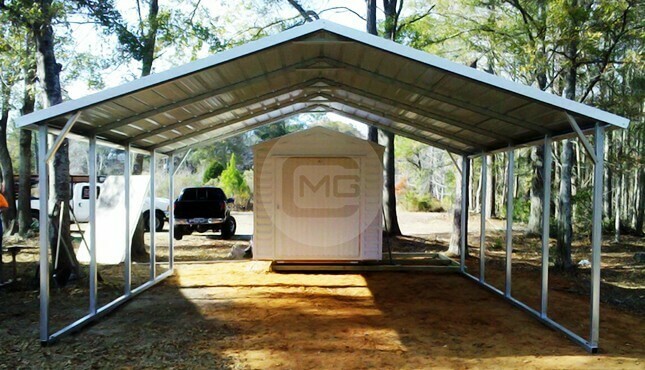 Our metal RV garages are extremely rugged and versatile, and are a sound investment for protecting your RV investment! Our metal RV garages are effective at shielding your RV, camper, or trailer from the elements, but they’re useful in other ways, too. 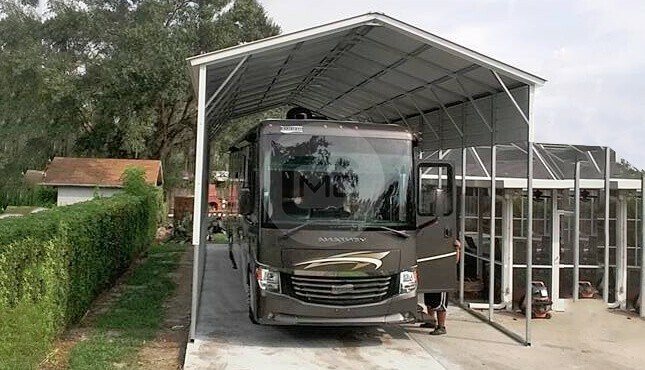 An RV garage from Metal Garage Central can double as an area to protect other vehicles or equipment, and can also be used as a dry and safe workshop, hobby room, or whatever else you may need. 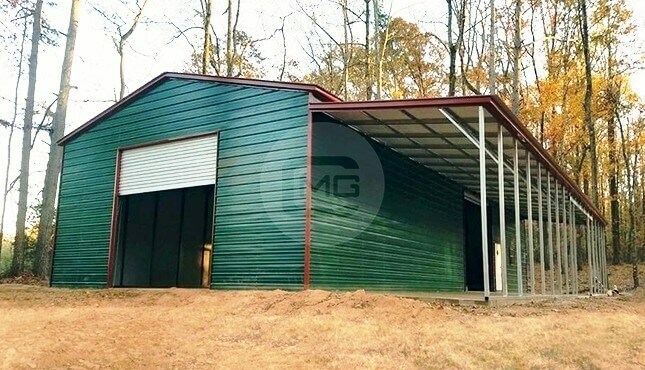 We can also add a lean-to metal shed attached to your garage if you’d like to opt for some additional covered outdoor space for a boat, trailer, another vehicle, or other items you’d like to shield from the elements. 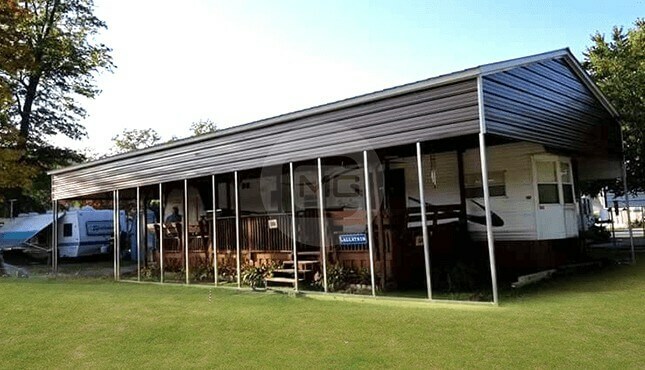 One of the first things you need to decide when choosing a metal RV garage is how you plan to use your structure. You’ll want to consider how much space you’ll need to be able to accommodate your RV and anything else you’d like to keep under cover. It’s also wise to allow for extra space to include future vehicle or equipment purchases. 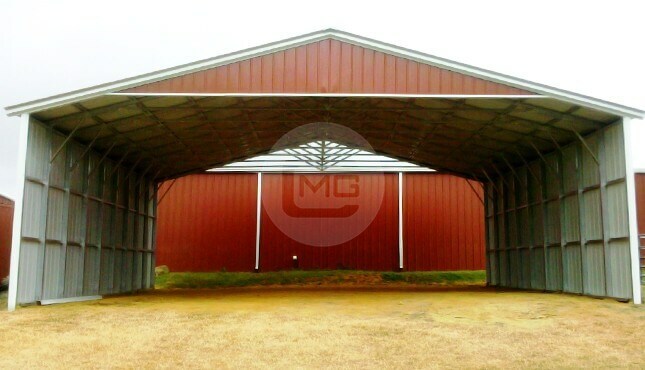 Engineered steel structures are available at Metal Garage Central in any custom size to fit your needs. 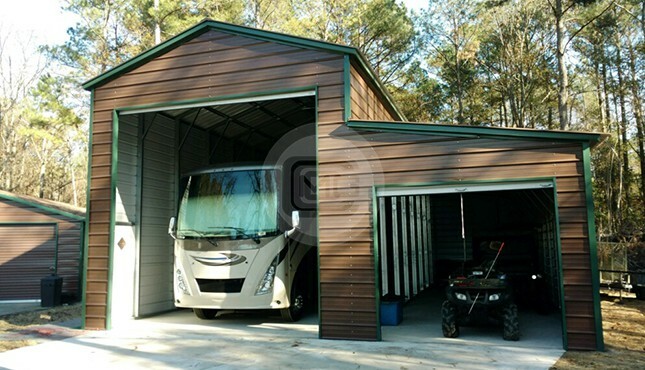 You choose the space dimensions you need, and we can help you design an RV carport or garage to suit your needs. We can provide steel structures large enough to house everything from RVs to motorhome buses to combine harvesters! You can also choose from different roof styles and from many different color options. 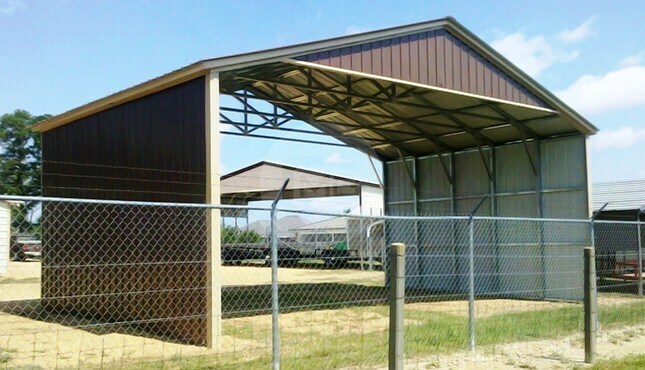 These precision-engineered steel structures are known for their strength, durability, & cost-effectiveness as compared to garages made with wood or other materials. 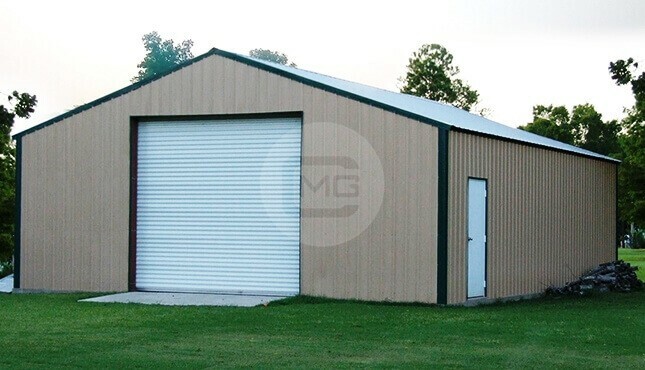 As mentioned above, free delivery and installation comes standard with our custom metal buildings, but perhaps you’re a DIYer who likes to save a little money by doing things yourself. For a cheaper price, we are happy to provide a custom-engineered steel RV garage kit that you pick up and install yourself. Everything you need is supplied in one convenient package. At Metal Garage Central we specialize in helping DIYers get the metal RV garage of their dreams, at the right price! Metal buildings don’t rot like wood and can stand up to constant use and extreme weather, including high winds, heavy rains, accumulating snow, lightning … and even earthquakes! The metal paneling can also be coated with aluminum compounds to help further prevent rusting and prolong the life of the panels. Our friendly, knowledgeable building specialists are here to help! We’re happy to walk you through the whole process, from design to ordering to production to installation. 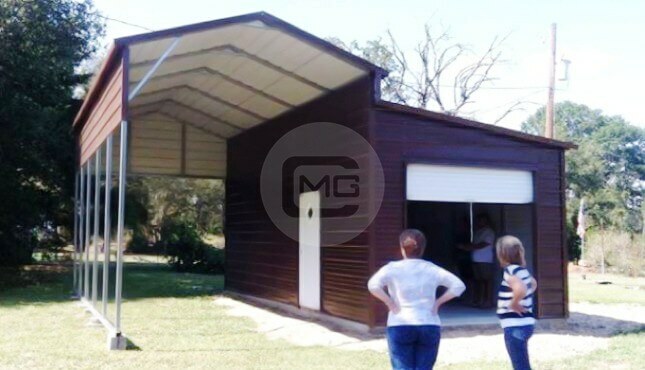 Check us out online at Metal Garage Central, or give us a call at (980) 321-9898 and let’s get started on designing the RV garage of your dreams today!